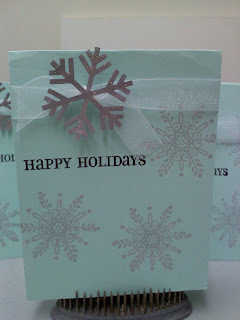 Create Embellish Adore: Aqua Snowflakes...? I have recently needed to do a paper clean out... some of the paper was old and I never used it anymore - because at one time "I was a paper hoarder"... after my 12 step program - I can say it and do something about it. This aqua paper, is such a fun summer color, but why not match it with some silver, pop a few snowflakes on it and be done with it? Its simple and fun!!! I have a few rhinestones I might attach later and give it more attention. I did dip the gray snowflake in glitter but the picture doesn't reflect that much! I picked the Aqua color paper for a fun factor... and I was inspired after my recent mailing of a new hat. And many thanks to my new friend Brooke, http://www.hookernextdoor.com/, for the great butterfly cap in turquoise! My daughter fell in love with it as well, and at 12, that means its great! She's got some wonderful handmade goodies! Thanks for supporting our troops too! Hi, My name is Kim and I'm a paper hoader and this is one of my favorite colors to hoard!!! Great card, love the silver on it!